P.T. was one of my first patients today. He’s one of those fit and trim guys in his mid-50s. He runs every day, lifts weights, so on and so forth. And it shows! But a couple of weeks ago this fellow ended up in the emergency room with a painful case of kidney stones. Today was his follow-up visit. During our consultation he told me that he recently started gaining weight. He has also been plagued with constipation and fatigue. As he reeled off his symptoms, the odor of his breath hit me like a brick. And I could see right off the bat that he was pretty dehydrated. After doing a little digging, I found out the guy had been loading up on protein in an effort to improve muscle mass. If he had discussed protein-loading with me beforehand, I would have discouraged it. I know it’s a popular muscle-building strategy on the gym circuit these days, but it can actually undo many of the masculine achievements gained by hard work, sweat and extreme dedication. It can take you from fit to flabby in a matter of weeks. That’s because too much protein can be just as bad as too little. And it explains every single one of his symptoms. Protein isn’t calorie free. If you take in more protein than your body needs, it will eventually be stored as fat. It also makes your kidneys work overtime to get rid of all the excess protein and waste products associated with it. So you have to pee constantly. And that dehydrates the body. Too much protein increases urinary calcium and uric acid levels too. Both of these contribute to kidney stones. Plus many high protein diets are lacking in fiber, resulting in bad breath and constipation. But P.T. isn’t the norm. He’s the exception. About one out of every three men and 45% of women between 51 and 60 years of age fall well below recommended levels of protein intake. And the numbers only get worse for people in their 70’s and 80’s. To top it off, your ability to synthesize protein declines with age. So if you’re not eating enough to start with, it becomes a double whammy to your physical well-being. When you don’t get enough protein, muscle loss is sure to follow. This is a condition known as sarcopenia, or muscle-wasting. Once it strikes, even the simplest of activities like household chores, bringing in the groceries and trimming the hedges become difficult. If that’s not bad enough, those spindly muscles could even make you weak on your feet and cause balance problems. The fact is, protein provides the building blocks for healthy muscles, bones and cartilage. It’s absolutely necessary when it comes to repairing damaged tissue. Protein is even involved in enzyme and hormone production – it’s found in every cell of your body. When you get the right amount of it (not too much, and not too little), it actually does help you maintain a healthy weight and promote lean muscle mass. It also curbs hunger, and helps you get over those aches and pains that follow a good workout more quickly. So what is the ideal amount of protein for you? What foods do you get it from? When is the best time to eat it? I don’t always agree with government recommendations on food intake and nutritional values. So I take their general recommendation to eat about 0.36 grams of protein per pound of body weight daily with a grain of salt. It might be enough if you’re sitting in a recliner or office chair all day and have no activities planned. 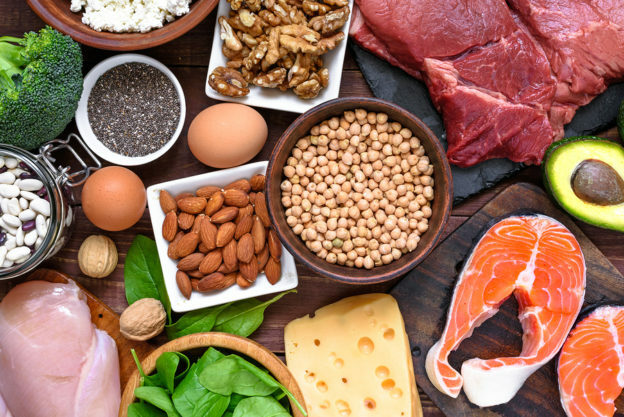 But if you you’re an active adult who wants to maintain your muscle strength, physical abilities and health, you should increase the amount of protein to .5 grams of protein per pound of body weight. Start the morning with your highest protein intake. Reduce it a little bit at lunch… and a little more at dinner. At the same time, don’t forget to include other food groups. Your body needs plenty of healthy fats and plant-based carbohydrates just as much as it needs proteins. You can get plenty of protein from beans, nuts, seeds, coconut milk, kefir and plain organic Greek yogurt. You can even whip up a protein shake or smoothie. Wild caught fish, grass-fed beef and pasture-raised poultry are other good sources of protein. Just don’t go overboard on them. These meat sources of protein should only account for about 13% of your diet. Clin Nutr Res. 2015 Jul; 4(3): 137–152. Nutritional Management of Kidney Stones (Nephrolithiasis). Han H, et al. Krok-Schoen J.L., et al. Low Dietary Protein Intakes and Associated Dietary Patterns and Functional Limitations in an Aging Population: A NHANES Analysis. 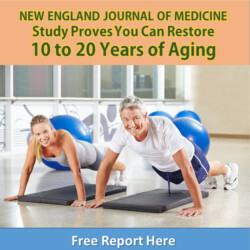 J Nutr Health Aging (2019). This entry was posted in General Health on March 18, 2019 by wellness.